Hardware hacks are something I feel we don't get enough of at Null Byte, so today I figured I would introduce a fun one. I've always been a curious hardware hacker. Taking things apart and learning how their internals work has always been a part of my nature. Quite some years ago, my father showed me a really cool trick on how to hack normal radios to scan frequencies that are normally non-listenable. This little hack allowed us to scan frequencies belonging to law enforcement, and even frequencies that the town fair had used to make announcements over a loudspeaker. To have fun with this cool hack, we're going to need a few things. Note: I'm not sure if this works on all radios. I haven't tried it on anything other than 3 cheap radios from Wal-Mart. I would imagine that all radios work the same, so in theory, this should be possible with any radio. 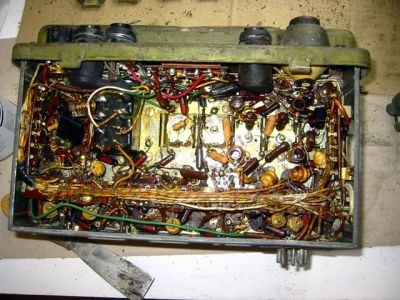 First, let's take apart the radio so that we can get to its internals. You need to remove all of the screws necessary to get the case completely separated. Depending on the radio model, this may mean that you need to remove all of the screws. Radios change which station they're listening to by adjusting a small, copper-looking wire coiled around a cylinder. When adjusted, the gaps between the coils in the copper wire become tighter or more separated depending on how the tuner knob is adjusted. Turn the tuning knob on the outside of the radio. Observe the mechanism connected to the tuning knob on the inside of the radio, while continuing to turn the knob. This will lead to your wire and cylinder that controls what frequency the radio is scanning. Turn the radio on. If it doesn't turn on, make sure everything is connected properly. Pull and separate the wire that is on the cylinder. You should hear the static shift and warp, this means you are changing stations. Adjust the coil until you start hearing human-related sounds from the speakers. Congratulations! You are listening to a broadcast that isn't supposed to be a broadcast. Follow and Chat with Null Byte! I usually do this with Wunder Radio on my iPod, but I had no idea you could do this on a real radio! Not sure which century this how-to was written in, but looking at the photo accompanying it I would guess towards the end of WWII. Most new and cheap radio receivers do not use capacitive/inductive resonator circuits you can toy with. Oh and by the way even if you can hack the cheap radio to receive in a higher or lower band, there is nothing interesting to listen to anymore as mobile phones, cordless phones, baby monitors, public safety and commercial broadcasts have either gone digital or are transmitting at microwave frequencies your hacked little radio just cannot get to, even if you hit it with a hammer. So, rather spend your money on a cheap radio scanner (also available at Wal-Mart) with which you can listen to many, many interesting things without having to hack anything. That's so awesome, thanks :) I got a new project to work on soon now, haha.